The impact of the fall of the Berlin wall was so big, that even Austria delivered a song about the subject on the 1990 Eurovision Song Contest. 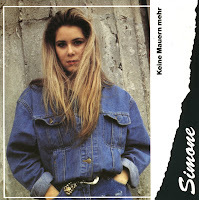 The song was performed by Simone Stelzer, who was born on October 1, 1969 in Vienna. The lyric of the song speaks about the freedom brought about through the fall of the Wall. In keeping with the multi-national theme, she sung the song in German, English, French and Serbo-Croatian. The song finished tenth in a field of 22 competitors.